If you haven't heard of Vooza yet, you're missing out on a huge opportunity to buy their awesome new mobile app. Right? Or is it a free app? Wait, are they even building an app at all? Last month, an apparently faux startup called Vooza released a series of videos that parodied the startup world -- aiming squarely at the Silicon Valley tech scene. In the videos, Vooza's "CEO" Matt Stillman and employees spoof start-up world clichés like having conceptual -- if not highfalutin -- big ideas, websites that exist in perpetual beta, going to design school and the all-important Twitter protocol. Vooza may or may not be a real startup, and they may or may not be building a real app. The one thing they are doing is creating a ton of buzz without spending a single ad dollar. How? By being creative. The team responsible for Vooza saw an opportunity in the seemingly endless spawning of tech startups today and decided to capitalize on it. Online video is an extremely compelling form of media, and, with great writing, solid actors and a vast knowledge of the startup/tech industry's most recognizable buzzwords and catchphrases, you can easily grab people's attention. Not only has Vooza managed to grab that attention (see TechCrunch, Wired and Huffington Post articles), they've gotten people to share their hilariously ambiguous content -- successfully building an audience that isn't even sure of what they're selling. The only burning question now is, what is Vooza going to do with this audience? Actually make and sell an app? Make videos for other companies? Or will they ride the wave of comedy and create an online entertainment channel? No matter what Vooza decides to do, their out-of-the-box thinking is a perfect example of how businesses can stand out from the crowd. They didn't create a groundbreaking medium. There are, of course, hundreds of thousands of videos made every day. 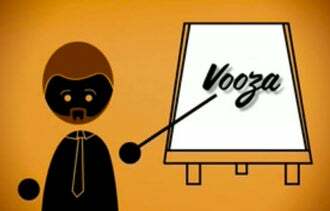 Vooza simply made their funnier and refreshing. They saw a comedic opportunity in something that's relevant to large number of people, and it's paying off. So to all the aspiring startups, entrepreneurs, current business owners, take note: Being creative will get you much further in the media, in growing an audience and in creating buzz than any Facebook or Google ad campaign ever will. Create something worth sharing, whether it's relatable, mind-blowing, or simply just clever. It's nearly impossible to pay for the type of exposure Vooza has received, and it all stems from being unique and creative. Now if you'll excuse me, I have a synergy happy hour I need to attend so I can make sure my business pivots in the right direction to attract VC attention. What do you think Vooza is selling? If anything?? Let us know in the comments section below.